Tintii is a one-trick pony. But that one trick is impressive in its creative potential and even more so in how easy and quick it is to achieve. 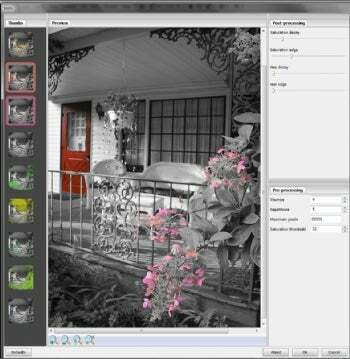 Tintii analyzes the major hues of a photo, so you can choose which specific ones to retain. The other colors are desaturated to grayscale. While the standalone version is free, a useful Photoshop plug-in is only $9. On opening, Tintii displays four thumbnails. One is entirely grayscale. The other three are grayscale with a single color retained. You can increase the number of thumbnails, which creates more and more subtle color separations. Then, click on one or more thumbnails to include the selected colors in your final image. That's all there is to it. The dialog is enlargeable to your full screen, and because the preview window is zoomable, you can view lots of detail in your image. However, the thumbnails are fixed at very small sizes that sometimes make it difficult to tell what your results will be until you click on the thumbnail to look at the effect on your preview. Tintii's slider controls are limited, and, depending upon the color composition of your original picture, you may end up with some unwanted areas of color in the background. That's why it's useful to purchase a key for the very inexpensive Photoshop plug-in so you can use Tintii with your imaging program's tools to help refine your picture. The interface of the Photoshop plug-in (which is not available on Linux) is nearly identical to the standalone, with the added advantage of being able to fit Tintii in your normal imaging workflow. We were pleased to discover that Tintii functions well on individual layers in images. Tintii is a remarkably easy solution for a color-popping effect that normally would take you lots of time (as well as skill and effort) carefully using your imaging program's selection and color tools. We highly recommend trying it.